It’s never too early to start getting excited about College Signing Day! College Signing Day has grown into a movement where counselors and students in all 50 states, including DC, Puerto Rico, and the US Virgin Islands, celebrate students and build a college-going culture at their schools. We’ll be counting down to May 1 with Eric Waldo, executive director of Reach Higher, at noon ET on March 13. 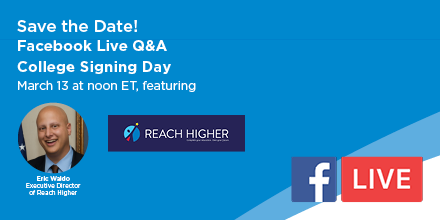 We’re chatting about plans for celebrating College Signing Day and the 5th anniversary of Reach Higher. Tune in to learn more about ways you can celebrate your students and watch the full conversation live on NACAC’s Facebook page. Have questions about College Signing Day or for Waldo? Ask them during the Live using the video’s comment section or submit them ahead of time via email.